Asphaltic based roofing products have long been used as protective waterproof coatings on many different types of roofs. Most people have experienced the smell of a hot tar truck as it was creating or renovating a new roof in their city. 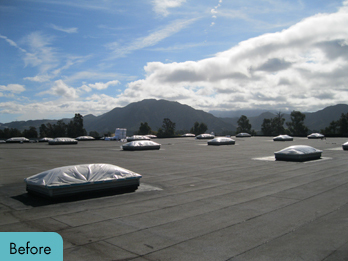 These asphalt and coal tar built up roofs have evolved to include prefabricated Built Up Roof (BUR) and Polymer Modified Bitumen (Mod Bit) Membranes available in smooth surface and granulated mineral surfaces. These types of roofs have performed well; however, the life expectancy is limited based on several different factors. Premature aging can result from excessive heat generated by the dark surfaces, water infiltration from bad drainage or improper flashing details, or poorly insulated buildings. These aging effects result in splitting and cracking of seams, excessive granule loss, blistering, and overall drying of the asphalt creating a brittle membrane. All of these aging effects of an asphaltic based roof can be remedied using National Coatings products. Depending on the severity of the problem and the age of the roof, a roofing contractor can use our ARM or AcryPly systems to restore or extend the life expectancy of your roof. 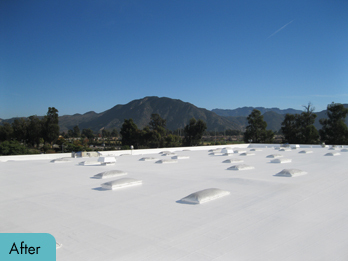 Our products are specially formulated to resist the difficulties of water, the bleed through effects of exposed asphalt, UV degradation of the asphalt product, and our high reflectivity and emissivity traits create a cool roof surface that can withstand the rigors of the summer sun. All these things can happen with little disruption for installation and almost no VOC contaminants or fumes during the process. The best part is this process can be done several times without having to tear the roof off, eliminating the need for a costly tear off, creating a truly sustainable roof. AcryShield A400, A420, A500, A503, A510, A550 and A590. Quickset products A600, A603, A610, and A640.